This building is almost completely covered, roof and all, with a thick layer of violet, resinous ichor in thick striated tendrils. The doors have large symbols similar to the illithid text found in the lair under Safeharbour. The thick resinous ichor continues inside making the floor uneven and slightly springy. Inside the floor of the upper story has been removed, leaving just a few broken beams jutting from the walls. The building has been divided into two sections. A large table littered with strangely shaped tools; knives, mallets, saws and so on, fills a third of this room while a trio of stocks are set up near the resinous wall that divides the building in two. A translucent curtain of veined purple resin leads to the north half of the building. A pile of opened skulls is neatly stacked in the south west corner. The stocks are occupied, three thralls hang lifeless, gruesome fluids dripping from their emptied skull cavities. A heal check (DC15) on the bodies suggest that the thralls were killed in the past couple of hours. This room is much warmer than any you have been in for some time and the air is heavy with a briny steam that rises from a raised pool in the north-east corner. Three soft, mossy pallets are set against the west wall. The three illithids (Flense, Khamthek and Marsth) are hiding in the steamy shadows near the ceiling, the shadows and the steam as well as their positioning means that the PCs will have to make a spot check at DC11 to see them. Before the PCs enter all three will cast levitate and will be floating 12’ off of the floor near the ceiling. When the PCs enter the illithid’s lair all three will cast a post-hypnotic suggestion that there is nothing to find there on the first three through the door. The enforcer, Hurzed will be summoned to attack those leaving. As soon as any of the illithids drops below 25% of their hit-points or run out of pp they will plane shift. 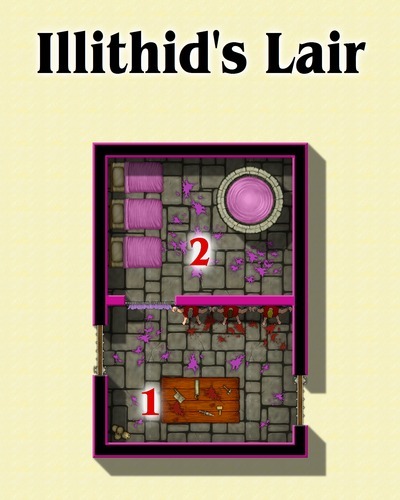 Hidden behind a loose stone block in one of the walls is a locked and trapped iron chest containing some of the illithids choice trophies. The chest’s lid has been sealed with red wax that features a seal of a rampant wyvern set over the chest’s lock. The hinges and banding on this chest are gold-plated (worth 20gp if scraped off).